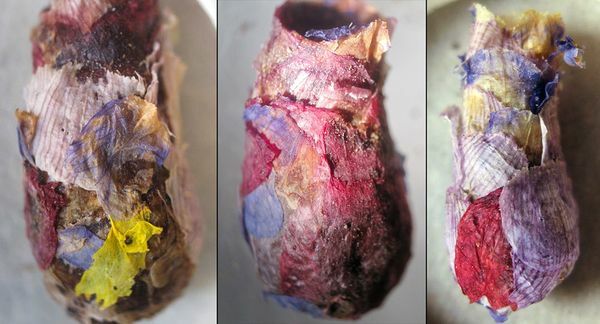 There is a honey bee found in Turkey who builds a beautiful nest of flower petals to keep it's larvae nourished and protected for the winter. She flies in petals one by one from nearby fields and glues the layers together with mud, overlapping them in an exquisite loveliness. This process for the solo female honey bee can take days to complete. The result is not only a perfect protective home for it's offspring, but it is also an intricate, beautiful, colourful, magical work of art. Ever since seeing the photo of these nests and reading about them I have been playing with flower petals. For my Week 6 Ring for the Ring a Week project I have made a little bead using pressed tulip petals and I have strung it on a square silver wire which I've then twisted and shaped to make into the ring.